The traffic-jammed town surrounding one of America's biggest malls is being turned into a pedestrian-friendly community. Is this the city of the future? Some 120,000 people work in Tysons Corner, Va., but only 17,000 live there. 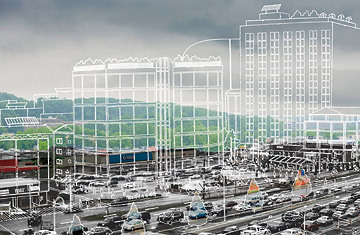 To transform this hotbed of suburban gridlock into a green, walkable city, a soon-to-be-adopted plan-as envisioned by our artist-calls for as much as tripling the current square footage by expanding upward, with the tallest buildings located next to four new train stations, which should be completed by 2013.